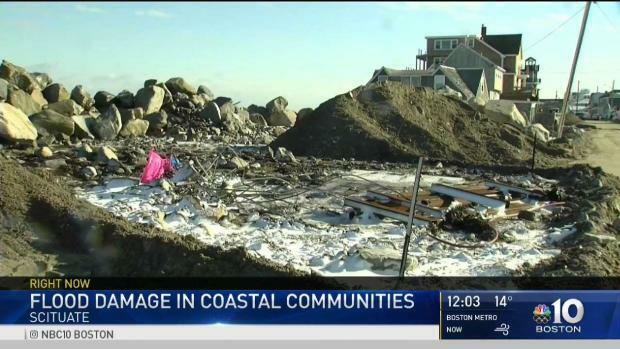 Much of Scituate, Massachusetts, remains iced over after flooding during the storm, and the seawall sustained damage from the waves. Coastal Massachusetts communities hit hard by flooding during high tide in Thursday's massive snowstorm are starting to clean up from the damage left behind. In Scituate, hundreds of residents are still without power after a seawall failed during the storm, causing water to flood homes and business along Oceanside Drive, Lighthouse Road, Rebecca Road, Sixth Avenue, and Seventh Avenue. Doris Crary not only owns the Oceanside Inn, but she lives there, as well. A solid seawall is critical for both her home and business. "It would be wonderful if all of the seawall could be replaced," said Crary. 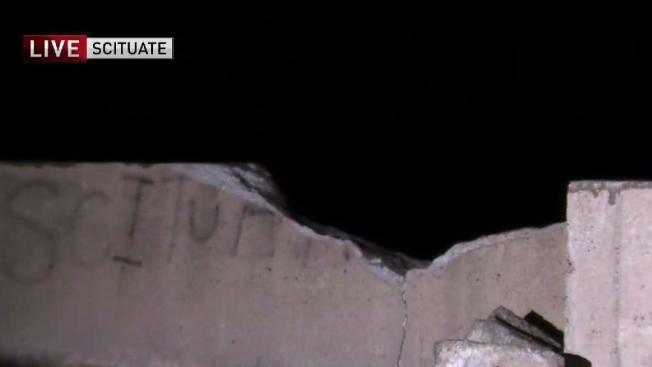 The seawall is regularly battered, but Thursday's stomr took a chunk out of it. This storm was one of the worst to strike Scituate, in terms of high tide and powerful waves. A section next to the inn is paying the price. "It's pretty close to a collapse," said Joe Rossi from the Marshfield Coastal Coaltion. "This stretch of seawall has seen three breaks in the last eight years or so." Rossi says part of the 10-mile stretch of seawall along Marshfield and Scituate dates back 80 years, and though the costs are as astronomical as Thursday's tide, replacement and rebuilding will be critical. He estimates about half the seawall needs to be repaired or replaced. There are strategic plans, but it could take years, and funding is always an issue. The full extent of flood damage is still being assessed in Scituate by town officials. Many residents were forced to evacuate, including the Anderson family, who escaped by a canoe. "We are watching it come up, come up, it is not going to get any higher, all of a sudden it is in our living room," Emily Anderson recalled. Scituate police said the National Guard's presence was critical to the town's emergency response for about four hours because police, fire and DPW crews were unable to access the waterfront neighborhoods without the National Guards' vehicles. Scituate Police Chief Brian Stewart said the town received nearly 140 calls for assistance, ranging from gas leaks to evacuations and rescues. While the waves were crashing Thursday, Scituate's harbormaster was rushing to secure his boat when he was knocked into the water. "I saw him and I just said, 'I don't have much more time, I can't hold on anymore,' and he grabbed me," Mone said. "He saved my life. I'm grateful, I can't thank him enough." 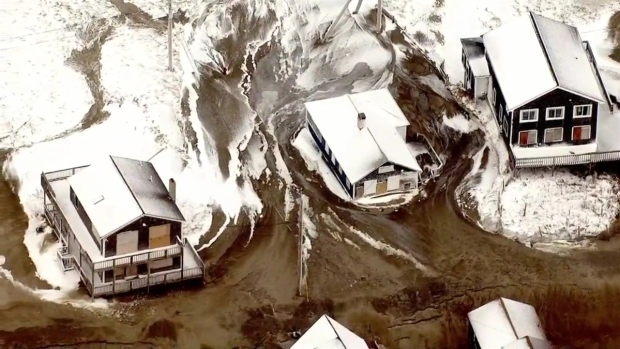 Sky Ranger footage from multiple other communities, including Marshfield, Hull, Marblehead and Rockport, showed dramatic damage, including intense erosion and cars frozen in slush. By Friday morning, many vehicles were left frozen in the ice due to the flooding. In Sciutate, hundreds of residents are still without power after a seawall failed during the storm, causing water to flood homes and business along Oceanside Drive, Lighthouse Road, Rebecca Road, Sixth Avenue, and Seventh Avenue. Construction crews have been out with National Grid crews trying to help in the clean-up process. At the height of the storm, 600 residents were in the dark after the power went out; by Friday morning, 300 residents remained without power. The worst flooding on Thursday happened during high tide at 12:40 p.m. In Boston, the high tide gauge hit 15.16 feet, breaking the all-time record from the Blizzard of 1978. Town officials in Scituate and Marshfield had advised residents who live along the coast and in neighborhoods that flood to evacuate by 10 a.m. Thursday. "The house was literally shaking this morning when I got up," Will Boyle, a Scituate resident who evacuated the flood zone on Thursday, said.